You’ve made the big decision to create your most confident and healthy smile. Now you are probably wondering what that will entail. Our experienced orthodontists in Cary and Raleigh will partner with you to create a treatment plan that fits your lifestyle during your free initial consultation. Braces have come a long way and are no longer unattractive metal brackets. Today your orthodontic treatment plan will be tailored to your style preferences and involve a treatment plan that gets you the fastest results possible, comfortably and affordably. There are three types of braces available for orthodontic treatment. Each treatment type involves specific compliance requirements and treatment timelines. Traditional braces are the most common type and are more comfortable today than ever before. They are made of surgical grade stainless steel. With stainless steel braces, you have the option of adding colored elastics (rubber bands) to show off your personal style or support your favorite team. 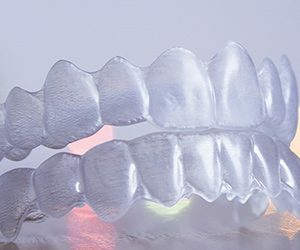 Invisalign is a series of practically invisible, removable, and comfortable BPA-free acrylic trays that straighten your teeth like braces. Because the aligners are removable, you can eat and drink what you want while in treatment, plus brushing and flossing are less difficult. The aligners are more comfortable than metal or ceramic braces. However, Invisalign can only correct certain problems. When you have your free consultation with Dr. Walton or Dr. Maready, they will discuss if Invisalign is a treatment option for you. Clear (ceramic) braces are made of a ceramic material and are therefore less visible on your teeth than metal braces. For this reason, clear braces are used mainly on older teenagers and adult patients who have cosmetic concerns. While they are visually less prominent, they do require more attention to oral hygiene as clear braces are larger and are more brittle than their metal counterparts. For these reasons, clear braces tend to be used more on upper front teeth than on lower teeth. When you first get your braces, you may notice that your teeth and mouth feel tender or sore. To relieve discomfort, we recommend dissolving one teaspoon of salt in eight ounces of lukewarm water. Swish this solution for just a minute but do not swallow the saltwater. If the pain is more severe and does not go away after swishing, you can also take a pain reliever such as aspirin, Tylenol, or Advil. It is also not uncommon for your lips, cheeks, and tongue to become irritated for one to two weeks as they become accustomed to the braces. 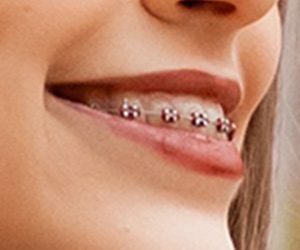 We will give you wax to put over the braces to lessen the tenderness. If you need more wax, please let us know. If you find that you are sore after every appointment, it doesn’t hurt to take a pain reliever such as aspirin, Tylenol, or Advil an hour before your appointment. You would then follow the directions on the pain reliever package on dosing. If your teeth begin feeling a little loose, don’t worry; this is normal! Your braces must first loosen your teeth to move them into the right position. 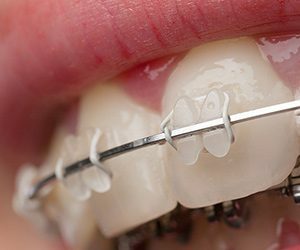 The wires and bands on your braces may come loose. If this happens, please contact us as soon as possible so that we can check and repair your appliances. If part of your appliance comes off, be sure to bring it to the office with you at your next visit. You can temporarily fix the loose wire by using the back of a spoon or the eraser end of a pencil to carefully and gently push the wire back into place. If the loose wire is causing irritation to your lips or cheeks, put wax or a wet cotton ball over the broken wire to eliminate the discomfort until you can come in to have it fixed. Frequently damaged appliances can increase the length of your treatment process, so be sure to take care of your appliances. Your teeth and jaw can only move into their correct positions if you consistently wear the rubber bands, headgear, or other appliances prescribed by your orthodontist. You can still play sports while undergoing orthodontic treatment in Raleigh. If you play contact sports, it’s recommended that you wear a mouthguard to protect your teeth and your appliances. You can purchase mouthguards specifically designed for people with braces at your local sporting goods store or online. Let us know if you need help fitting a mouthguard to protect your teeth. In case of a sports injury, be sure to immediately check your mouth and appliance for damage. If you notice loose teeth or damage to your braces, please contact us right away. Considering orthodontic treatment is a big decision, we want you to have all the information you need to choose the right treatment plan for your lifestyle. If you have any questions, before, during, or after treatment, please call our office.